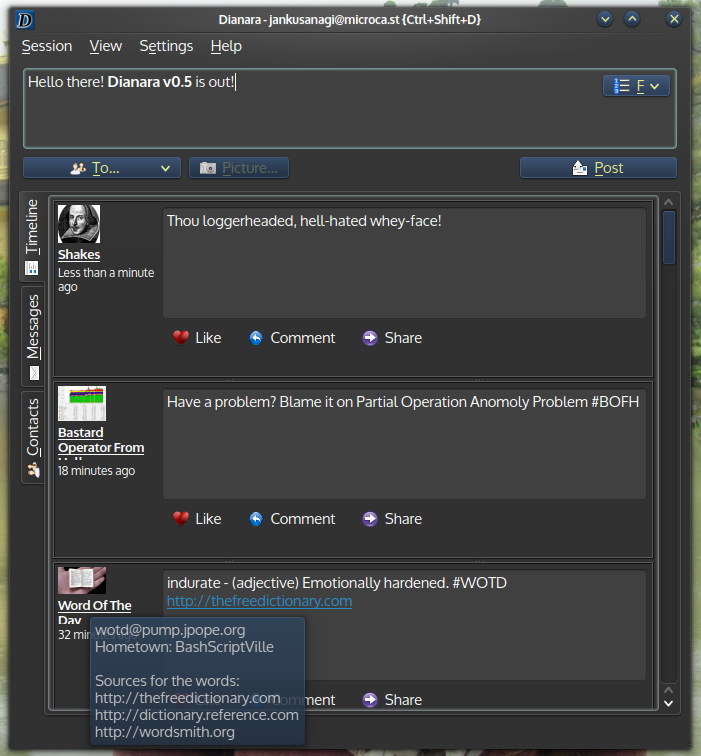 Today I released Dianara v0.5, my pump.io desktop application. The program is still far from being complete, but it can now be used for the basic tasks. With this version you can configure your account, authorize Dianara to access it, browse the timeline (number of posts per page can be configured), post text-only messages (with some HTML formatting), interact with posts (like, comment, share, delete), see the list of people you follow, and follow new people. There are also popup notifications when the timeline receives new posts, and there are some new tooltips in some places with additional information (try hovering the avatars and timestamps with your mouse). Keep in mind that some of the buttons and other widgets are still placeholders with no real use at the moment (like the Messages tab). You can get the code from Qt-apps.org: http://qt-apps.org/content/show.php/Dianara?content=148103, and hopefully we’ll see Dianara packaged for some GNU/linux distributions soon. For now, you can at least find it in Archlinux’s AUR. Debian users might need some components from the experimental branch at this time. Check the INSTALL file for details. This entry was posted on Thursday, May 30th, 2013 at 3:28 PM and is filed under Dianara, GNU/Linux, Projects, Pump.io, Qt. You can follow any responses to this entry through the RSS 2.0 feed. You can leave a response, or trackback from your own site.